Unlike other world-class vehicle concours events, the award-winning Concours of Elegance has no official judges or judging of car classes. The 60 assiduously selected concours cars participating in the 2014 Concours of Elegance – set to be held shortly at Hampton Court Palace from 5 to 7 September – are already regarded as winners by virtue of being chosen to take up their position within the stunning Fountain Garden grounds of the Royal Palace. Uniquely, the prestigious Concours of Elegance ‘Best of Show’ award is determined by the owners of the 60 concours cars themselves, with each owner having one vote to chose the car, other than their own, which they believe to be the finest example present at the event. The ‘Best in Show’ victor receives the prestigious Pullman Trophy. In addition, a new ‘Public Choice’ is being introduced for 2014, enabling all visitors to the Concours of Elegance to select their personal favourite car amongst the 60 concours entrants. Public Choice votes will be collected by text, with a donation to the event’s nominated charities being received with each vote. Another new Concours initiative for 2014 is the Club Trophy. This Trophy will be presented to the very best car to have won its own car club concours event earlier this summer, in recognition of the spirit and dedication of Car Club owners, and their support of the grass roots concours movement in the UK. 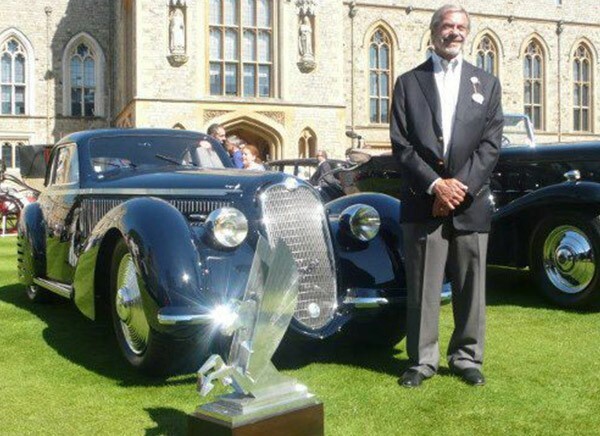 Each of the major prestige car clubs in the UK have now been invited to send the winning cars from their own car clubs’ concours events along to Hampton Court Palace in September, with a number of prestigious clubs already accepting this invitation. These include the Bentley Drivers Club, Aston Martin Owners Club, Rolls-Royce Enthusiasts Club, Ferrari Owners Club, Bristol Owners Club, The Royal Automobile Club, Jaguar Drivers’ Club, Maserati Club, AC Owners Club, Lamborghini Owners Club, Jensen Owners Club and the Gordon Keeble Owners Club. The Car Club cars will be judged for the coveted Club Trophy 2014 on Saturday 6 September by a panel of celebrities and famous faces. Fittingly, the Royal Automobile Club will be coordinating the judging for this new prestigious prize, with the Private Client Group of leading insurers AIG also supporting the Club Trophy. Ultimately the Club Trophy 2014 will be presented to the overall ‘Best of the Best’ club concours car. In addition to being awarded the coveted Club Trophy, the overall winner will also automatically be one of the 60 cars to be entered into the line-up for the 2015 Concours of Elegance event, to be held at an as-yet unspecified British Royal Palace. More than 500 top cars from each of the major British car clubs will be displayed within the picturesque grounds of Hampton Court Palace on Saturday 6 and Sunday 7 September, including a number of each club’s concours-winning vehicles. The 2014 Concours of Elegance at Hampton Court Palace will be open to the public on Saturday 6 September and Sunday 7 September, with adult entry tickets, and hospitality, still available to purchase strictly in advance from £25 per person, per day. Advance tickets can purchased at the Concours of Elegance website (www.concoursofelegance.co.uk), giving free entry to Hampton Court Palace too.